This picture, slightly larger than an A4 sheet of paper in size, was commissioned as a gift. The recipient loves his canoe and so the person who commissioned me to make it wanted the panel to show a canoe being used in a historical setting, as well as an otter and a heron (which were favourites of the person receiving the present). Luckily the grey heron that is commonly seen along European waterways has a North American cousin, the great blue heron, which looks similar apart from being slightly bigger. 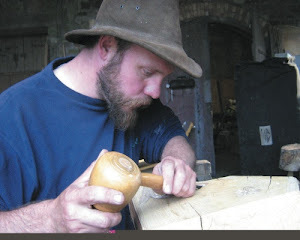 The oak panel was carved using a mix of traditional tools and a Dremel hand drill. The drill was used to give the texturing effects to the woodlands in the background. The mountain man and his Algonquin friend/guide look more surprised than overjoyed to see the heron take flight. Maybe they are carefully watching to see exactly what disturbed it? I think that the picture has the feel of a 'Boy's Own' style illustration from the 1940s or 50s, which is perfect! I'm also very pleased with the way that the grain of the wood adds to the feel of movement in the image.